Sons of Shiva is a sustained attempt to film a four day ceremony concerned with the worship of Shiva. Devotees of the God Shiva are shown from the initial taking of the Sacred Thread through gradually intensifying action to a culmination in a variety of ascetic and self-denying practices. Devotees are also shown in informal activities such as preparing food and listening to recitals of devotional songs by the famous mendicant Bauls of Bengal. Among the specific devotional practices is the fulfillment of vows to please the gods. 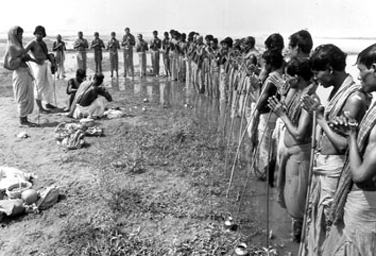 Many devotees resolve to roll in prostration through the field to the shrine of Shiva. Others participate in the nightly processions that involve falling in trance while dancing and holding a symbol of Shiva on one head. One of the highlights of the film is a performance by a group of Bauls (wandering holy men and religious troubadours) who sing devotional songs for the resting devotees. This film belongs to the Pleasing God series of films about how Hindus worship.